This sculpture is called The Newborn. I think this is a replica of the original, which is bronze, but perhaps Mr. Brancusi made some copies. I do not think he did, but I am far from an expert on art – of any kind! A friend found a book called The Quiet Eye: A Way of Looking At Pictures by Sylvia Shaw Judson, a Quaker. I thought it was a sweet picture, and was quite happy when I learned the artist was Romanian by birth. Two of my followers are Romanian, and I am always happy to learn something new about their country. My friend knows this, and suggested I put the sculpture on my blog. She thought the sculpture resembled a “Babe in swaddling clothes,” and I like her interpretation of the sculpture best. It is an inviting piece of artwork. 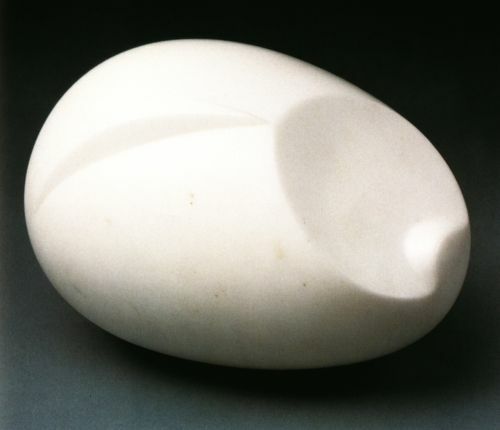 This entry was posted in Essay and tagged art, Constantin Brancusi, Contemporary Art, December 1981, Essay, France, French, Modern and Contemporary Art, Philadelphia Museum of Art, Romania, sculpture, Sylvia Shaw Judson, The Quiet Eye: A Way of Looking At Pictures, White marble on October 29, 2016 by The Mithril Guardian.